nature, astronomy, coffee, shooting and tech. who's got an external sump/refugium on their pico reef? hey adam, I would test the water and see how your amonia, nitrate and nitrite levles are. generally speaking the cycle takes about a month to establish with clean rock and most do a 50% water change after about 2 weeks. it's not discontinued...it's been rebranded and changed into a kit that comes with a filter sock, the custom caddy, mightjet pump and their magnetic algae cleaner. 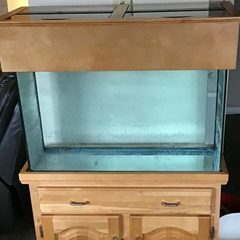 I really like the idea of the rimmed 30 gallon breeder, but due to it's size it's classified as a non-shipable item, so I can't get it. I live in the middle of nowhere that takes 2 days of driving to get here. I have a couple concerns with going bigger...a) being overwhelmed and b) having extra expenses due to the size. if I start small, I can use 1 gal distilled water for the changes, so don't need to worry about buying and setting up a RODI system. I can't exactly do what my grand plan would be, but it would let me get something up, gain experience and hopefully delight the grand kids when they visit. I want good aesthetics as the aquarium will be a centerpiece in the living room. I just realized I can get IM tanks...so I could get something from the Nuvo Black. just debating the IM 20 (non-peninsula) or the 30L. when you guys got into fish keeping, did you start small or jump in big? get the 13.5 or consider going low tech like WV Reefer. check out her 12 gallon long thats only got live rock for a filter. her KISS approach works! i want to do that with a 22 gallon long. I can get a rimmed 20 gal for $70 or a rimless 12 gal for $135. in all honesty, i really want a rimless 22 gal, but they’re unobtanium in Canada it seems and they’re 3x the price of the 20 gal janky. i’m debating if the high clarity glass n clean look is worth the price premium. so not something to worry about.